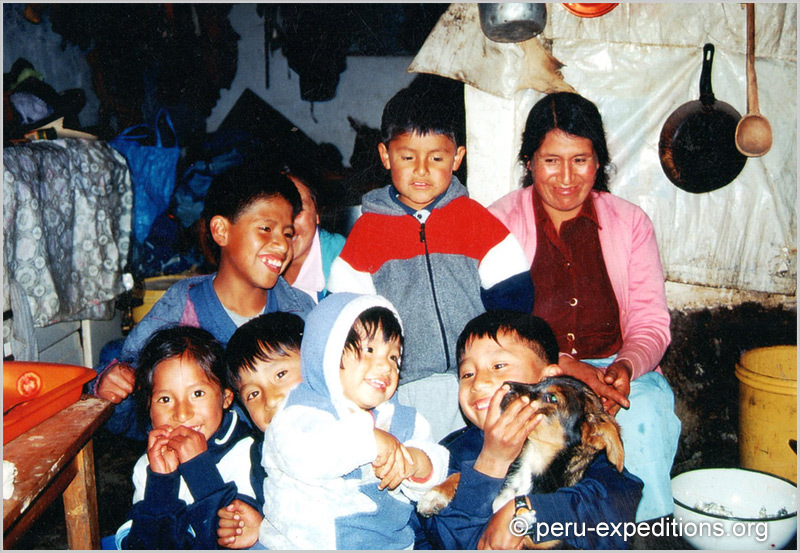 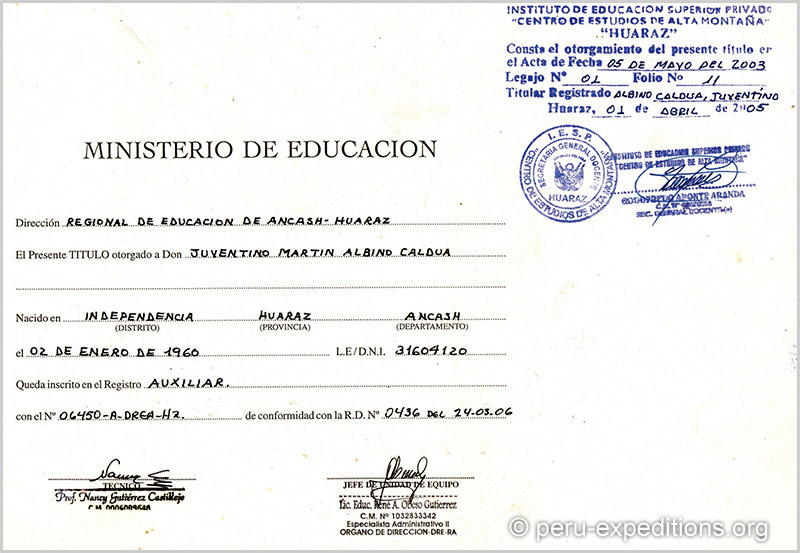 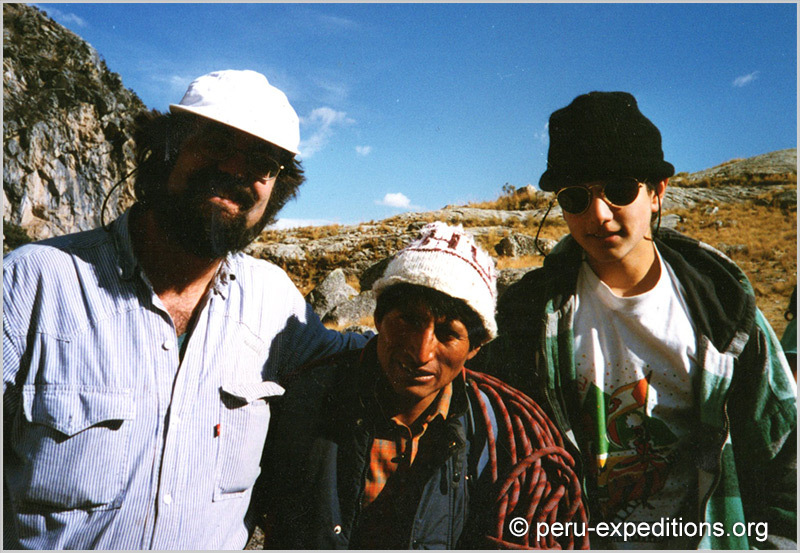 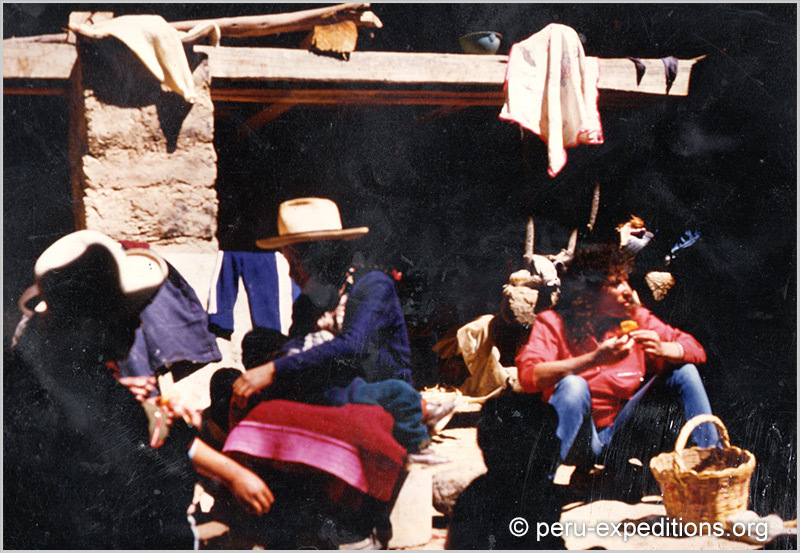 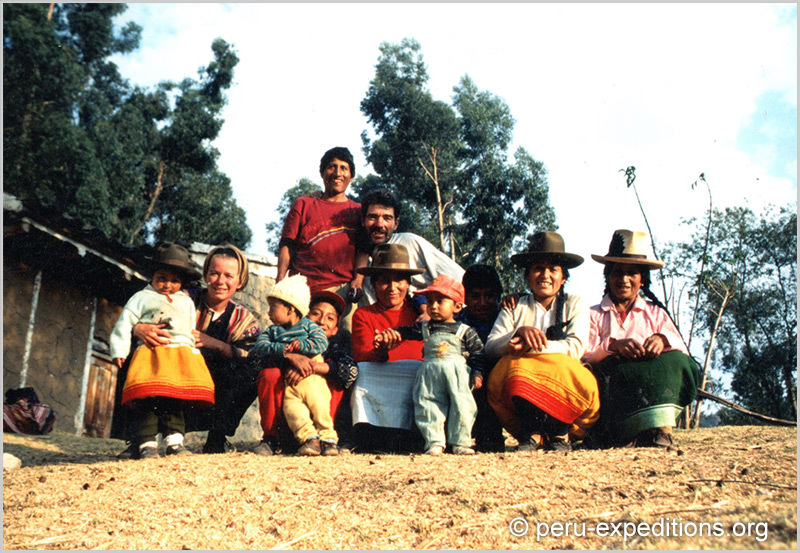 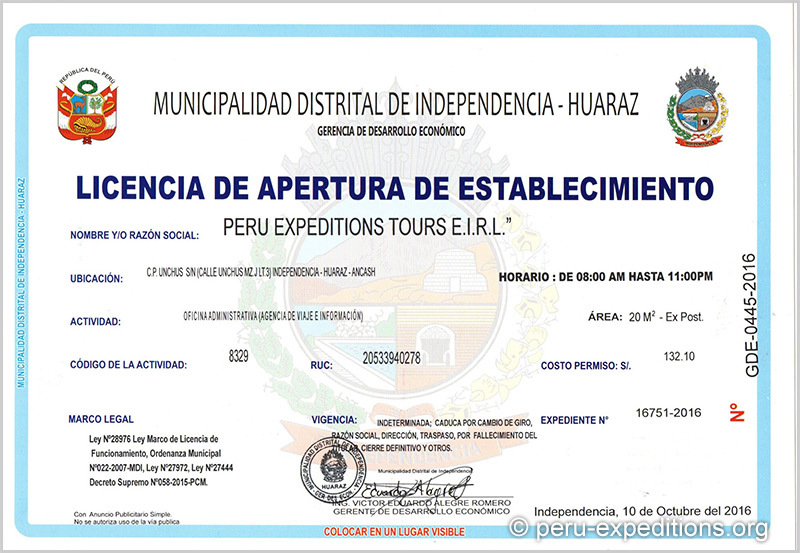 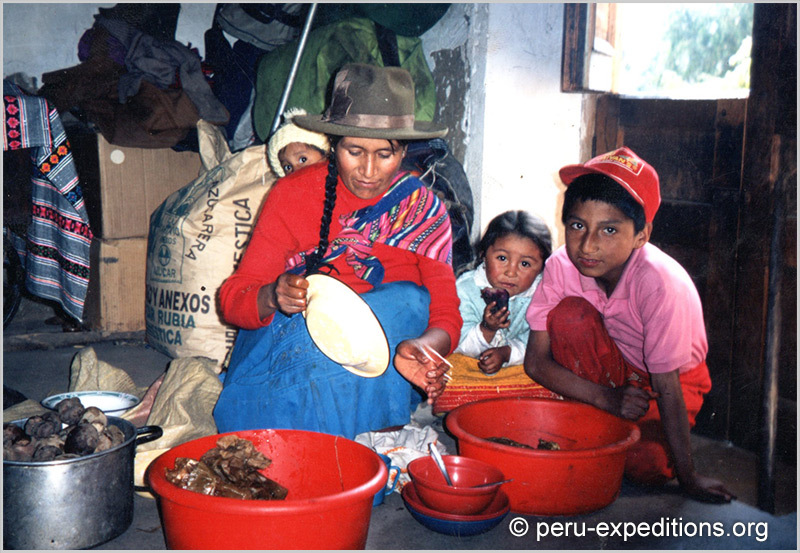 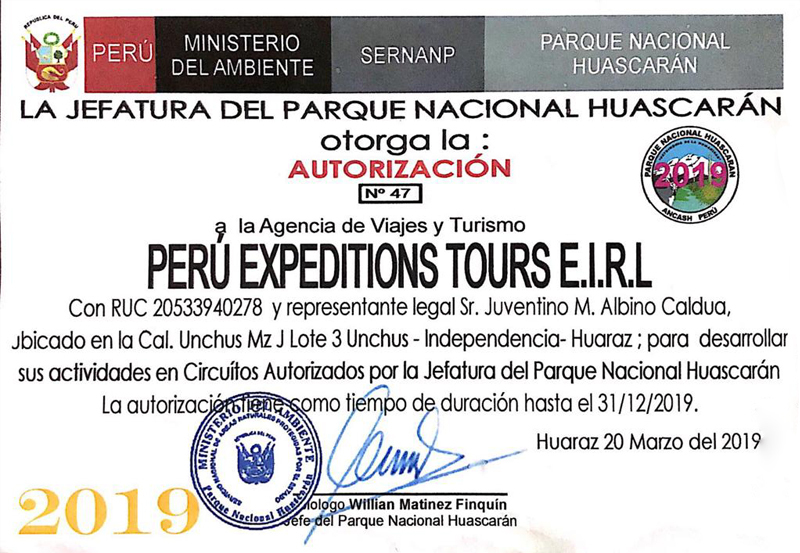 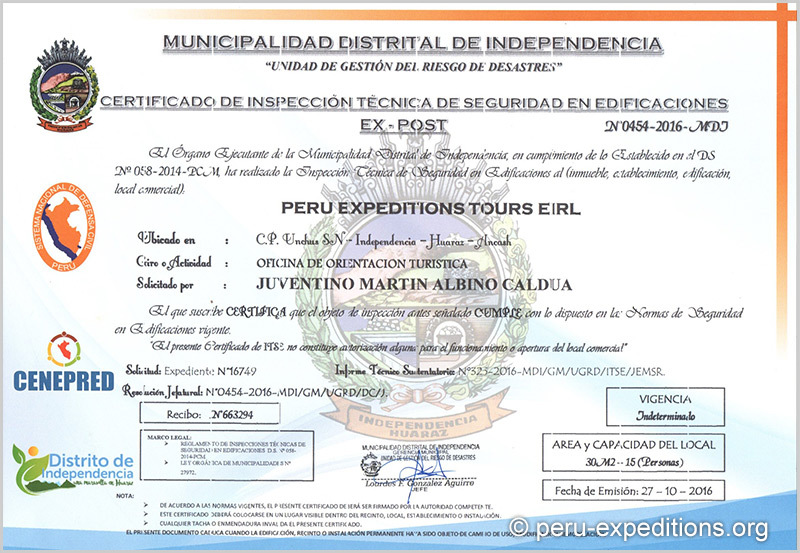 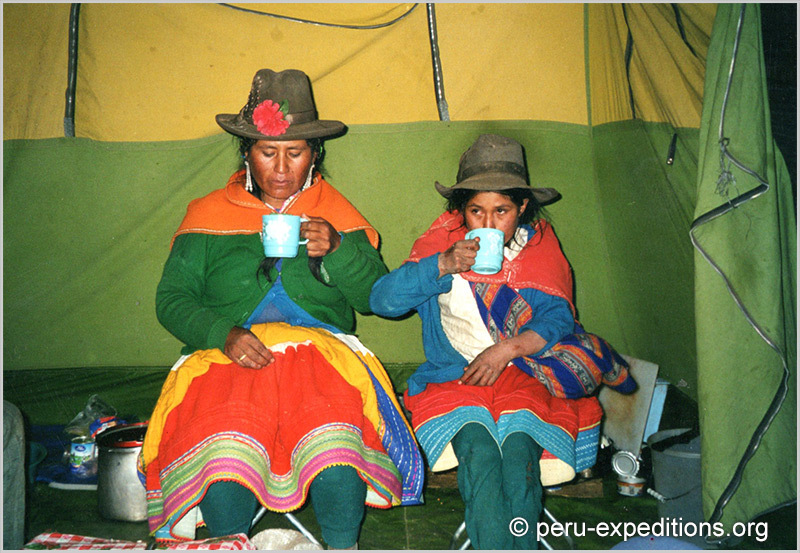 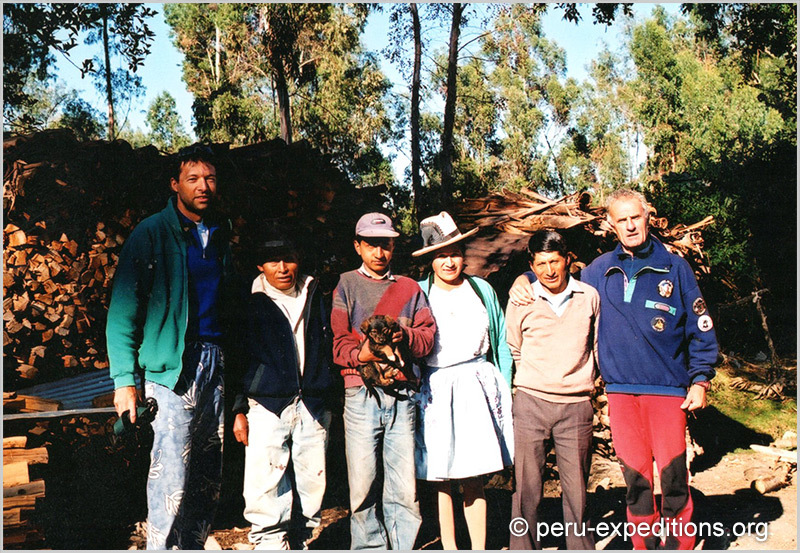 "Peru Expeditions Tours EIRL: International Adventures & Expeditions" Adventure Travel Agency was originally founded by Victor Albino more than 35 years ago. 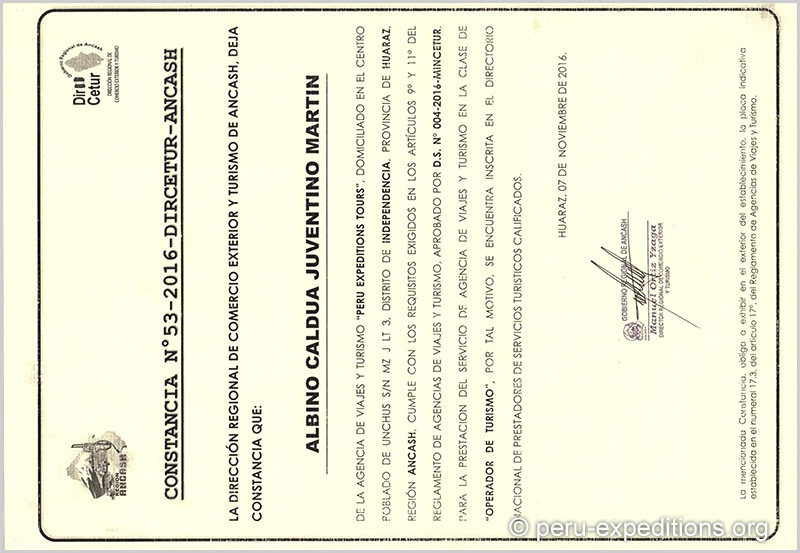 Who started this business Victor Albino has worked as a porter, donkey driver, cook and as a guide for European customers. 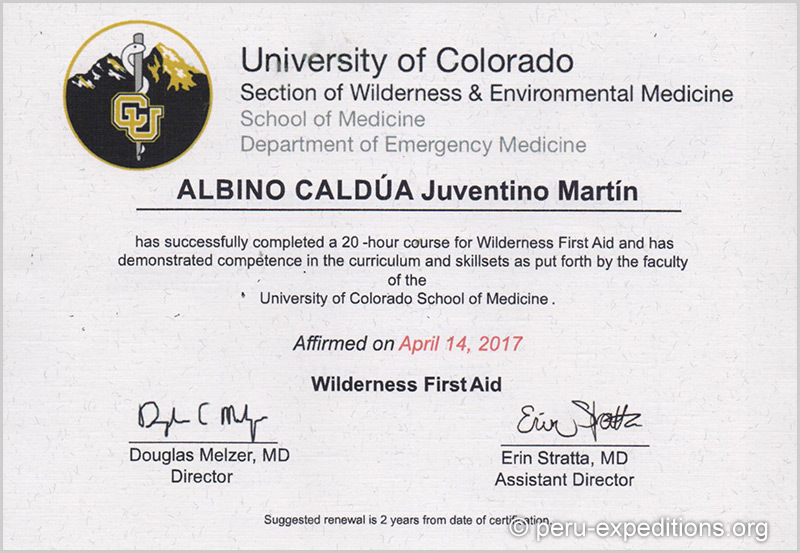 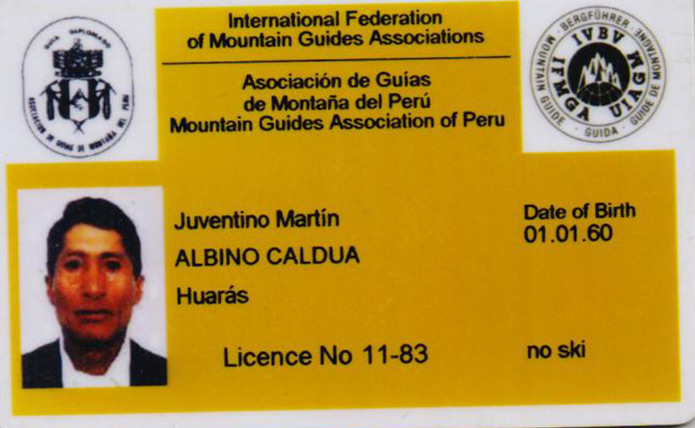 Having so much experience to rely on, his son, Juventino Martin Albino Caldua, who has followed his father footsteps in to tourism, started guiding in 1980 and studied 3 years at the “Peruvian School of Mountain Guides - Casa de Guias CEAM - Centro de Estudios de Alta Montaña” Formed under a bilateral agreement called the ‘’ Alps - Andes Project ‘’ between Switzerland and Peru, Its objectives are to form professional guides (School of mountain Guides) to be an official mountain guide the AGMP ‘’Asociación de Guías de Montaña del Perú’’ belongs to the UIAMG (Asociación Internacional de Guías de Montaña de todo el Mundo) which ensures dedicated, professional service. 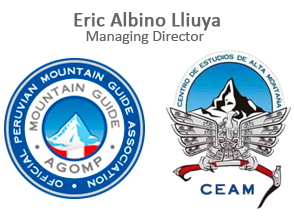 Since completing his studies, he has worked intensively with the European Guides members UIAGM, organizing expeditions to the Cordillera Blanca and Cordillera Huayhuash in the Ancash State, Peru..
At the moment he is a member of AGMP - UIAGM as a Professional Mountain Guide. 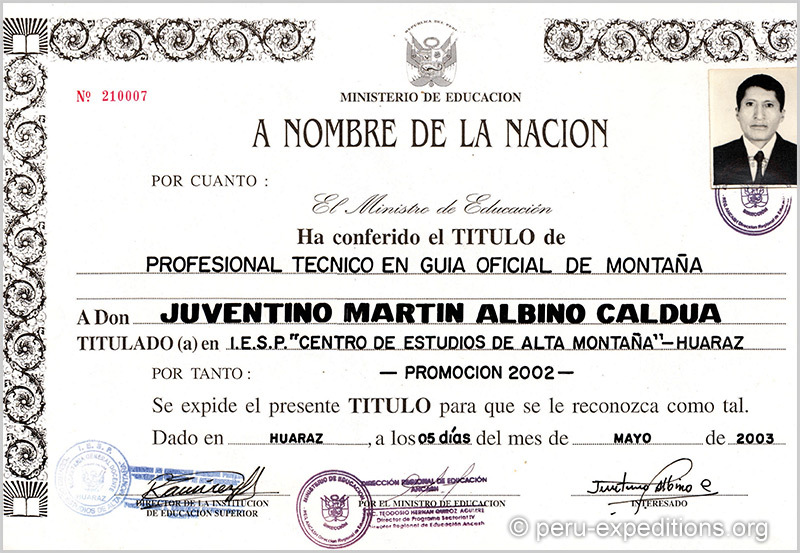 Juventino Martin Albino Caldua, son of Victor Albino has gathered an immense amount of experience by working with his father and foreign associations has finally founded the Adventure Travel Agency “Peru Expeditions” in South America and manages the business as the General Manager..
Juventinos has 3 sons, Eric Albino Lliuya is the oldest one, he is is from the same “Peruvian School of Mountain Guides - Casa de Guias CEAM - Centro de Estudios de Alta Montaña” who has following his father footsteps in to tourism. 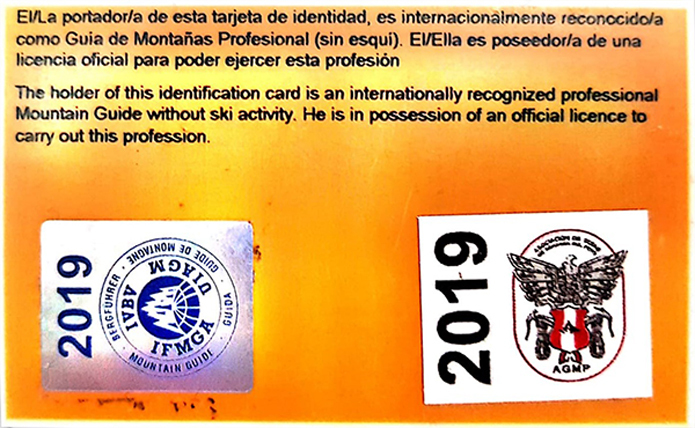 Also Eric climbed to different peaks in the Alps of Europe. 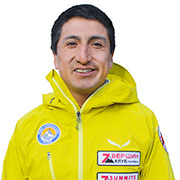 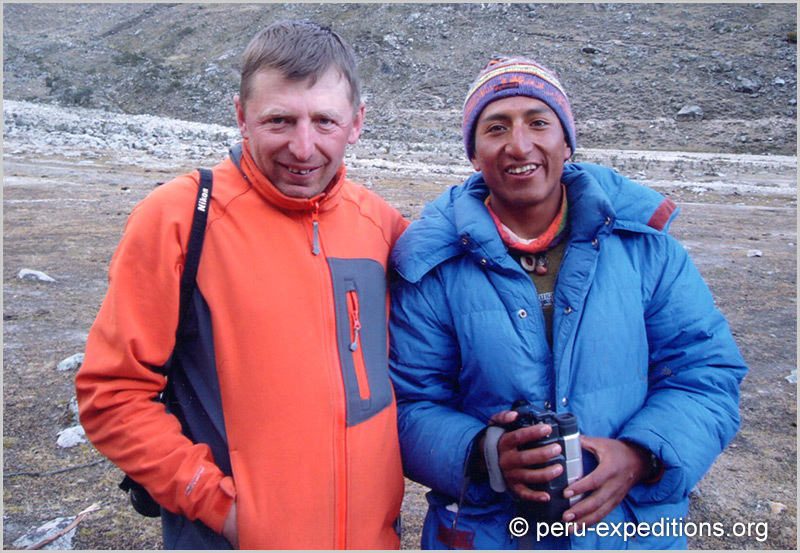 Eric Albino Lliuya is follow with new destination as well tour leader in diferent countries in South America. .
Eric at the moment he is a member of AGOMP (Asociación de Guías Oficiales de Montaña del Perú) as a Professional Mountain Guide. 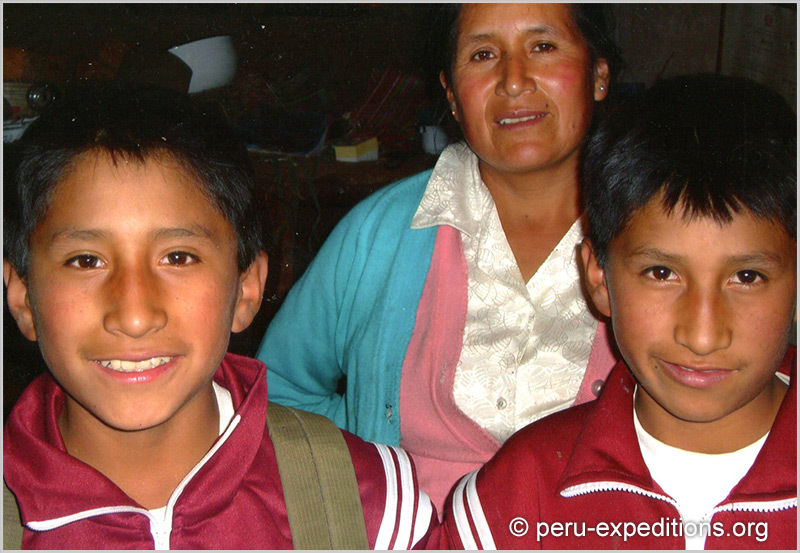 The other 2 Edwin and Elmer are Twins, they both are studying for official trekking guide. 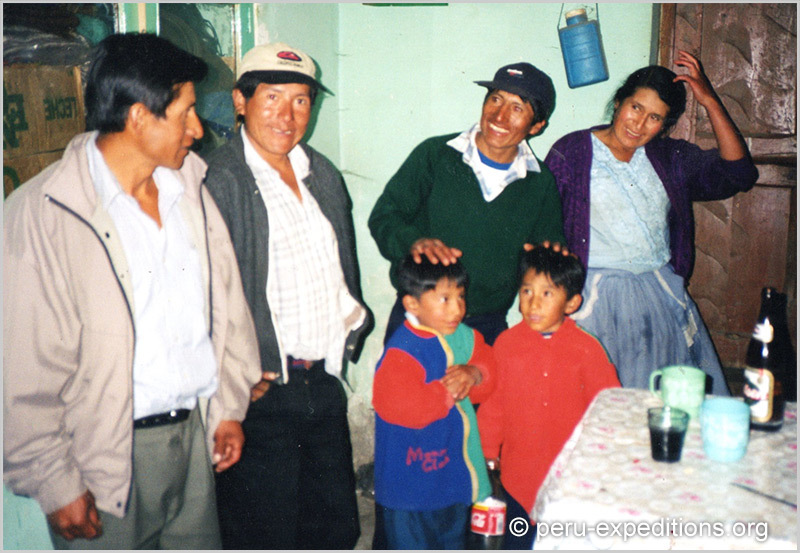 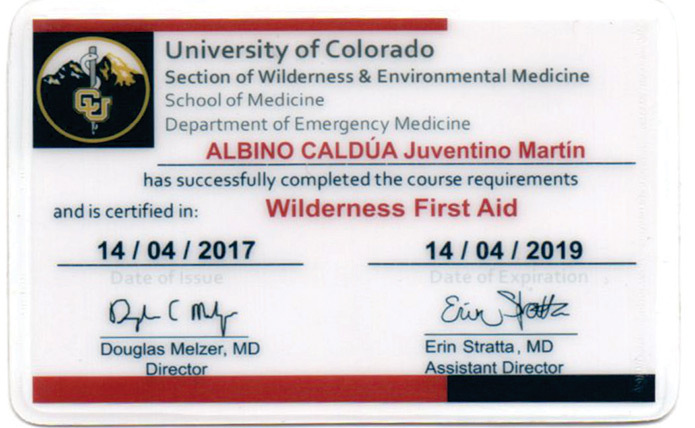 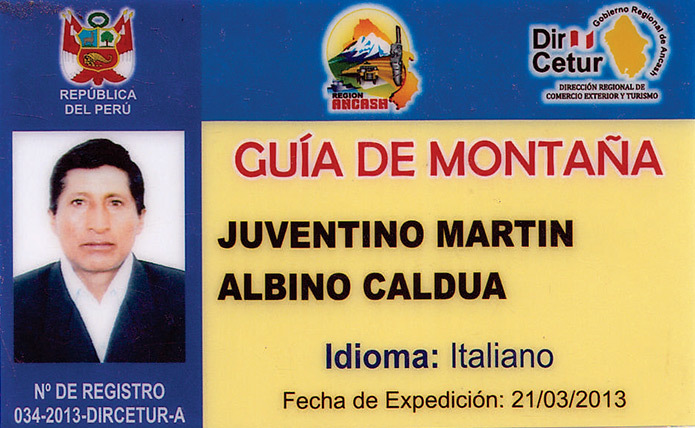 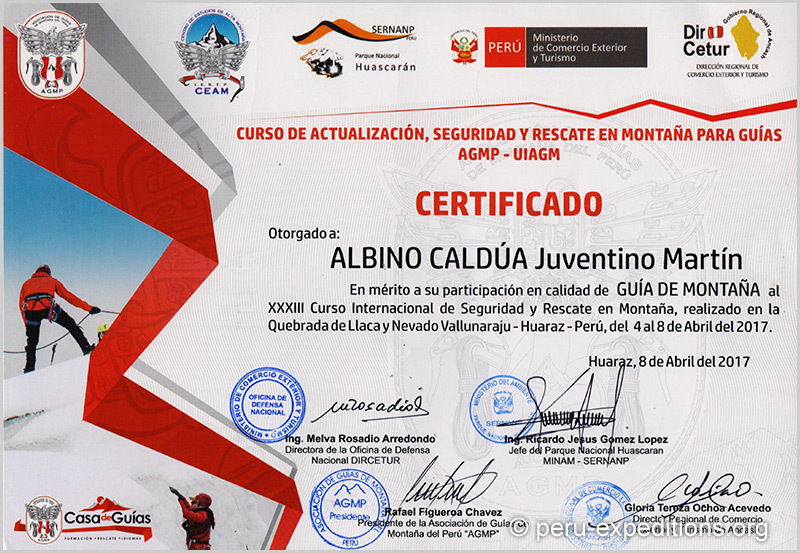 The Family of Mr. Juventino Martin Albino Caldua a mountain guide IVBV - UIAGM - IFMGA, our history about our job in the Cordillera Blanca and Cordillera Huayhuash trips. 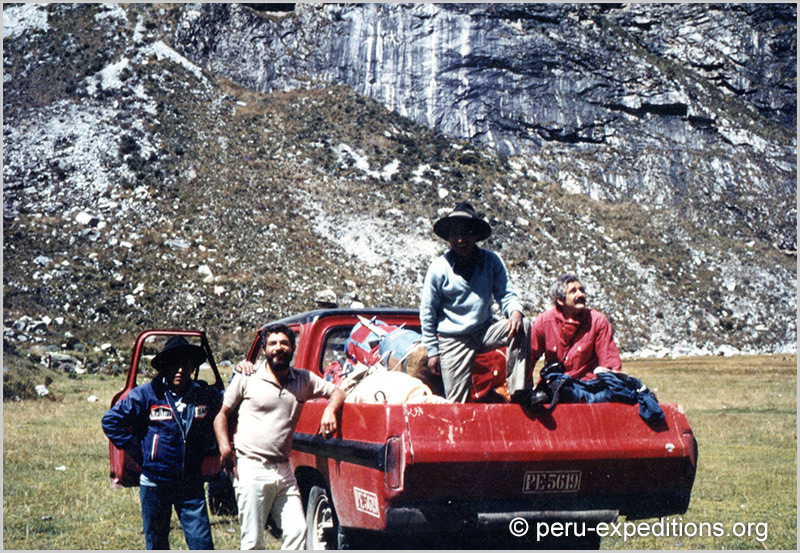 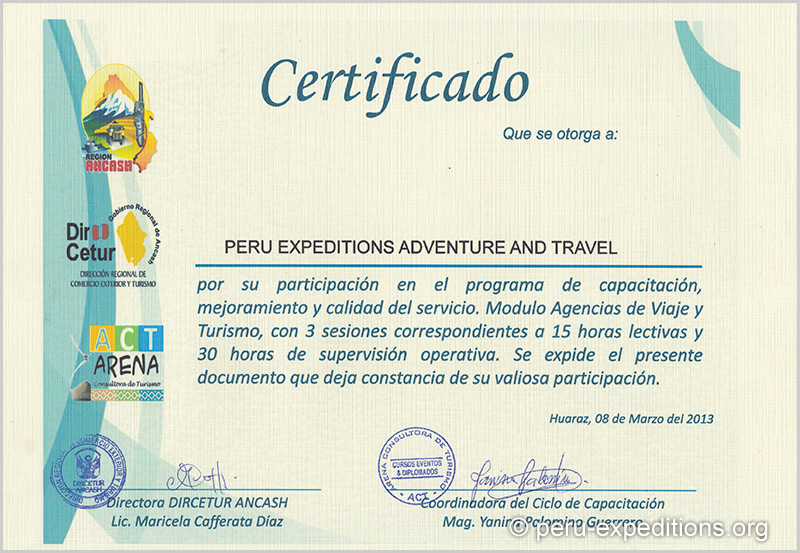 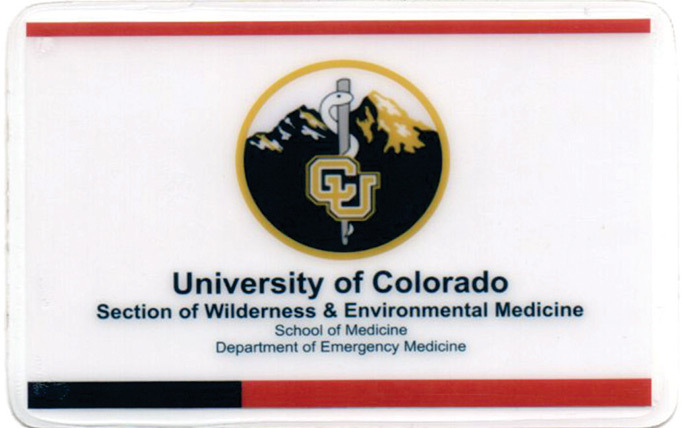 Since 1978 leading trekking, hiking and expedition.